Below are books written and edited by STAR Scholars Network. Members are encouraged to let us know if you’d like your book to be included here. Higher Education in Nepal: Policies and Perspectives aims to present a showcase of Nepalese higher education with critical perspectives on topics related to the impacts of local sociopolitical changes and global forces on public and private education, emerging online and distance education, administrative and intellectual leadership, quality assessment, graduate employability, global mobility of students, and the causes and impacts of global diaspora of Nepalese scholars. The central questions of the book are: What issues and perspectives can research and scholarship about Nepal’s higher education offer to international discourse in higher education? What are some of the local and global academic interactions in Nepalese higher education and what are the current challenges and pathways for advancements and improvements? How can Nepalese higher education absorb 21st-century values of quality education while adapting new developments to local needs? How can scholars interested in Nepalese, South-Asian, and international higher education create opportunities for scholarship and professional collaboration around research on higher education in this region of South Asia? This book offers information and resources to international educators interested in the dynamics of Nepalese as well as South Asian higher education by introducing the key challenges in policy and programs, innovative changes in curricula, effective approaches in technology application, and strategies for future integration of global reforms in education. Using qualitative data collected from twenty universities across the US, Writing Support for International Graduate Students (2018) describes and theorizes agency- and advocacy-driven practices, programs, and policies that are most effective in helping international students learn graduate-level writing and communication skills. It uses compelling narratives and cases to illustrate a variety of program models and support practices that fostered the students’ process of academic transition and success. Employing an ecological framework, the book seeks to advance the academic conversation about how writing scholars/instructors and program administrators, as well as other academic service professionals working with this student body, can formulate policies, develop programs, and implement practices that best help these students grow as writers and scholars in their disciplines. Global Perspectives on International Student Experiences in Higher Education: Tensions and Issues examines a wide range of international student experiences, including student life, engagement in degree courses and extracurricular activities, experiences of teaching and learning, use of technology, experiences of feedback and assessment, and other areas of student involvement. Understanding how international students experience higher education in different national, institutional, and disciplinary settings has been increasingly important to universities, educators, business leaders, and governments to increase revenue and campus diversity in the global marketplace. This book project will include three major elements–International Student’s College Experiences, Socio-Cultural Experiences, and Post- Study Experiences. 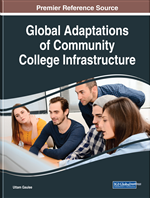 This book explores the complexities of community colleges and global counterparts by focusing on critical analysis of governance, leadership, and mission. These complexities represent emerging and evolving phenomena that impact the institutions’ ability to a) serve students; b) offer sound curricula; c) admit and retain students; d) increase completion rates; e) create viable and sustained partnerships locally and internationally; f) address the needs of unique populations; g) funding and sustainability, and h) support staff development to enhance faculty and staff excellence. This work will introduce and elaborate upon these topics to highlight not only the challenges of the field in a variety of countries worldwide but to also begin to build comparative understanding of the field at large. In that these institutions are now identified, it is time to academically address their role in higher education. 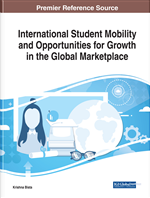 International Student Mobility and Opportunities for Growth in the Global Marketplace is a critical scholarly resource that examines recent trends in global student mobility in Australia, Asia, North America, Latin America, and Europe where the emerging trends and practices are prominent. Featuring coverage on a broad range of topics such as internationalization, cultural identity, and student mobility, this book is geared towards educators, education administrators, education professionals, academicians, researchers, and students. Campus Support Services, Programs, and Policies for International Students explores the role of university administration in successful implementation, regulation, and support of study abroad experiences. Highlighting essential topics relating to legal issues, safety concerns, curriculum development, and intercultural communication, this research-based publication is an ideal reference source for university administrators, school counselors, policymakers, and researchers interested in study abroad program implementation, regulation, and success factors at the administrative level. Exploring the Social and Academic Experiences of International Students in Higher Education Institutions is a pivotal reference source for the latest research on the issues surrounding study abroad students in culturally diverse educational environments. 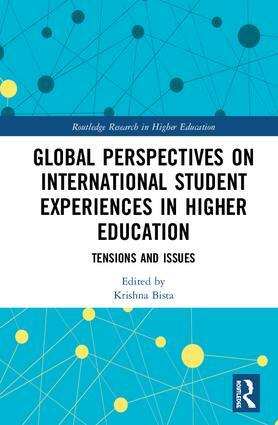 Featuring various perspectives from a global context on ensuring the educational, structural, and social needs of international students are met, this book is ideally designed for university faculty, researchers, graduate students, policy makers, and academicians working with transnational students. “This book is very timely and provides a comprehensive overview of various aspects of international student mobility. The editors should be congratulated on successfully bringing together the expertise of a wide range of authors from across the world.”– Divya Jindal-Snape, PhD, Professor of Education and Associate Dean, University of Dundee (Scotland), author of Multi-dimensional Transitions of International Students to Higher Education(2016) and Educational Transitions: Moving Stories from Around the World (2013). Global Perspectives and Local Challenges Surrounding International Student Mobility (2016) explores comparative research regarding the implementation of effective strategies needed when working with native and non-native individuals in educational settings. Offering perspectives from international student experiences, as well as views on current mobility trends, immigration policies, and challenges with cultural expectations, this publication will be a critical source for educators, policymakers, and university staff who interact with international students.